Malvern Panalytical is pleased to sponsor the annual Thesis Prize jointly awarded by the Physical Crystallography Group (PCG) of the British Crystallography Association and the Structural Condensed Matter Physics (SCMP) Group of the Institute of Physics. PANalytical has had a long association with the prize and this has continued since the merger with Malvern Instruments. 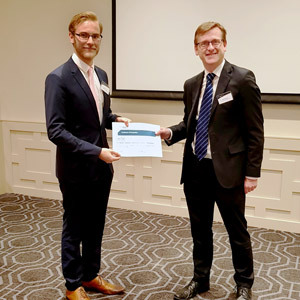 The 2018 prize was won by Dr. Lewis Owen of the University of Cambridge for his thesis titled “The analysis of local structural effects in alloys using total scattering and reverse Monte Carlo techniques”. As the most recent winner Lewis was invited to present his work at the Winter Meeting of the PCG-SCMP at Milton Hill House in Oxfordshire, UK. The winner of the prize is selected by the judging panel nominated by the PCG-SCMP committee. The prize will be awarded for the best use of techniques or methods of Physical Crystallography in a successfully examined thesis submitted in the period from 1st January 2017 to 31st December 2018. Here is the full details of how to enter and a list of previous winners. The candidate must be a member of the Structural Condensed Matter Group of the IoP and/or the Physical Crystallography Group of the BCA. Non-members may enter the competition but will be required to join the IoP/SCMP or the BCA/PCG at the student rate to progress their nomination further.